I’ve always loved the fall, maybe because my birthday is in September. But in Mississippi, it’s hard not to love a season that finally means an end to weather in the 90’s and high humidity. Usually around mid-September we start to get cold fronts coming through, and the temps don’t rise quite as high after they’re gone. You can’t really say there’s a chill in the air (as I remember from growing up in Iowa, looking forward to the first frost). 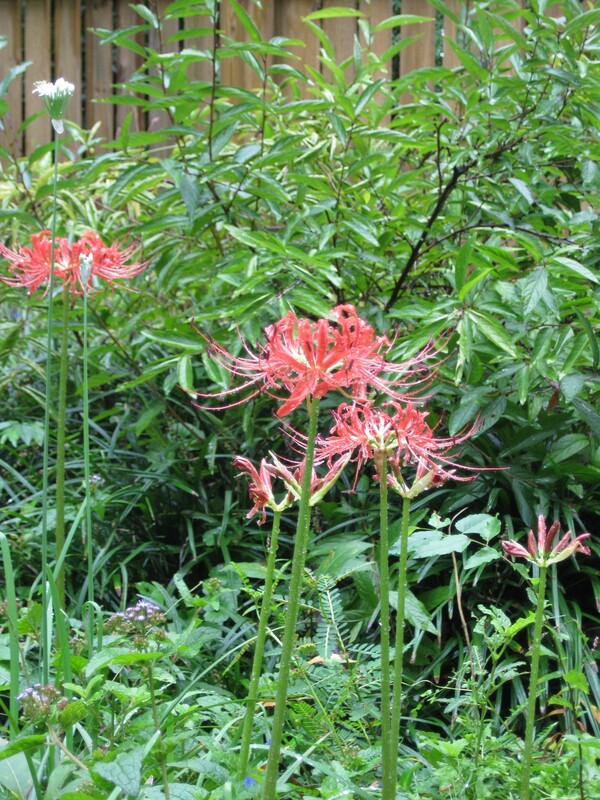 Here, one sign that fall has really come is the return of the Spider Lilies. They pop up, usually right around my birthday, though this year they seem to be a little later than usual, probably be cause it’s been so dry. I always try to notice when they appear–even before they bloom, you can see a slender stalk growing from the grass (or wherever they appear). The general term for this type of lily that comes up in late summer is the Surprise Lily, which is the title I gave a poem in my last book, Time Capsules. I was really thinking of the Spider Lily, but some people call them by the general term and others call them Hurricane Lilies because they come up in hurricane season, usually after a heavy rain. I’d like to think they’re wildflowers, but in reality, they are a non-native species that have escaped cultivation. Despite the fact that they’re really from Asia, not America, they have become part of the landscape here in Mississippi. Maybe their alienness is part of their charm. Fortunately, unlike some invasive species, they don’t appear to have a detrimental effect on the native environment. They don’t spread too much, and they don’t crowd out other species, but they do provide a little color this time of year.